But what about if you want the chart title to change depending on what is selected? 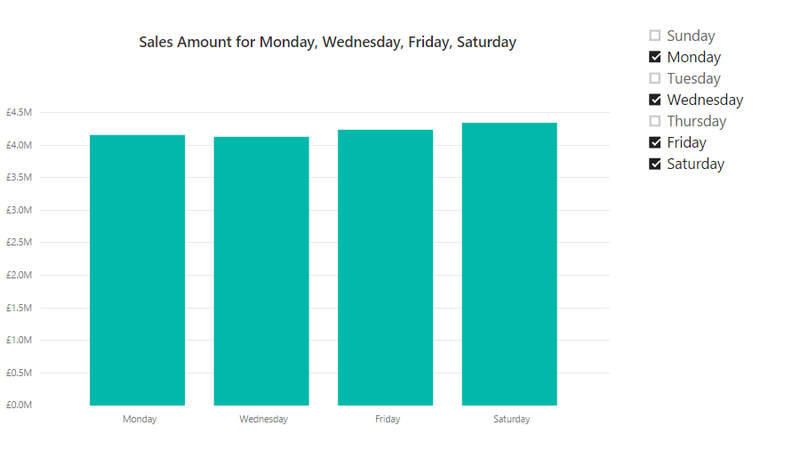 For example, you might be using slicers or filters to allow a user to choose which days of the week they want to see data for. 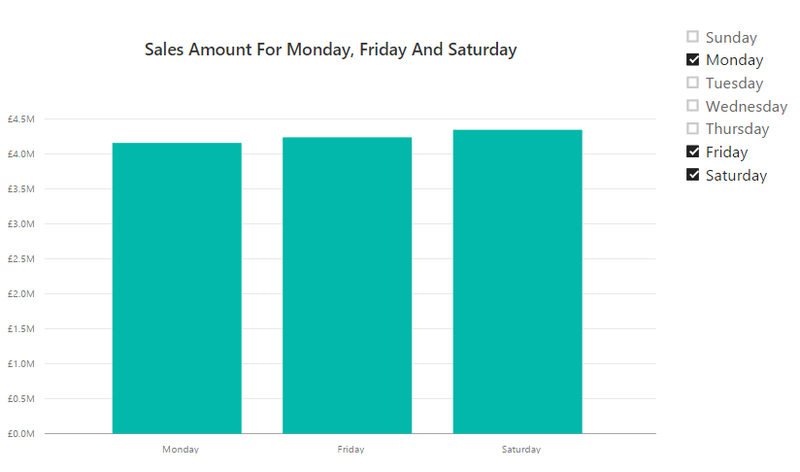 In that situation you might want to add a title that shows which days of the week have actually been selected; this would be particularly important if the report uses filters, or if the report is going to be printed. 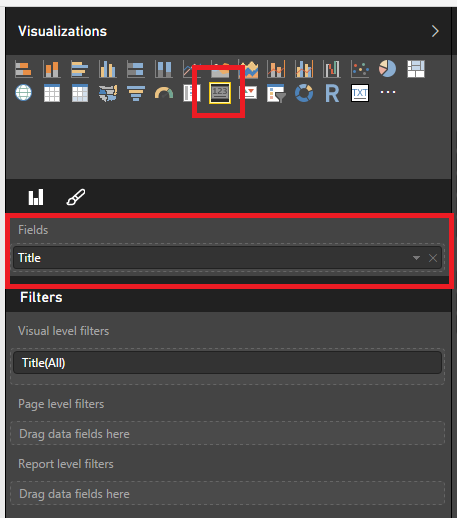 Unfortunately the built in Title Text property can’t be used to display dynamic values but in this blog post I’ll show you how to solve this problem using DAX. 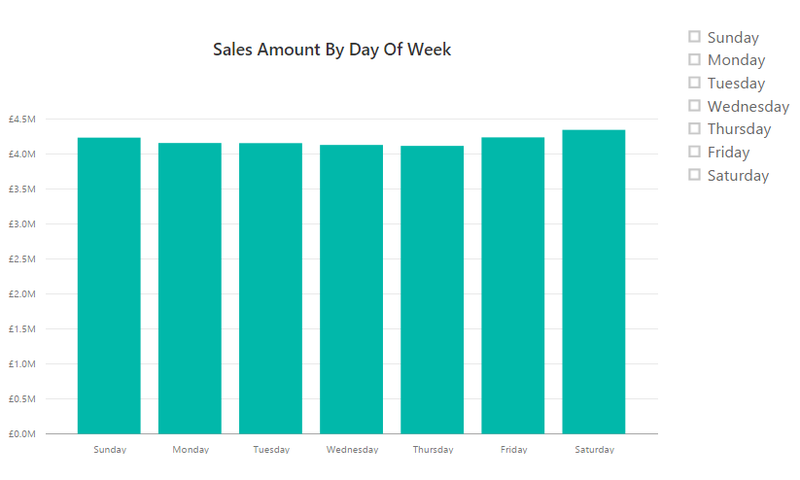 Using data from the Adventure Works DW database I’ve created a simple data model containing a Date dimension table called DimDate and a fact table called FactInternetSales; the DimDate table contains a field called EnglishDayNameOfWeek that contains the names of the days of the week, and the report contains a column chart that shows a Sales measure broken down by day of week. There’s also a slicer where the user can select one or more day and at the top there’s a title that lists the day names selected in the slicer and displayed in the chart. Here, the Values() function is used to return a table containing all of the selected days of the week, and this is then passed to ConcatenateX() to get a text value containing a comma delimited list of the day names. And this is all you need to do to recreate the report above. Concatenate the last selected day to the text returned by the previous step. I’ve used the Except() function to find the day that was excluded by the TOPN() function in the previous step. You can download a .pbix file containing all the code from this post here and I’ve published the report here. Last week one of the attendees on my SSAS cube design and performance tuning course in London told me that he had been prevented from running a Profiler trace on his SSAS Multidimensional instance by a DBA because “he should be using Extended Events”. He wasn’t too pleased, and I can understand why. This, plus the recent discussion about Profiler and Extended Events for the SQL Server relational engine provoked by Erin Stellato’s recent blog post on the subject, made me think it was worth writing a few words on this subject myself. Microsoft is clear that in the long term, Extended Events (also commonly known as XEvents) are the replacement for Profiler. This page shows Profiler listed as functionality that will not be supported in a future version of SQL Server – although, importantly, it is not deprecated yet. Profiler is still officially supported for SSAS and the SQL Server relational engine in SQL Server 2016. What’s more, in my opinion it will be a long time before anyone doing serious performance tuning work with SSAS will be able to forget about Profiler and use Extended Events exclusively. Let me explain why. First of all there is the fact that support for Extended Events in SSAS was only introduced with SSAS 2012. If you are using an earlier version you can’t use them. Even if you have some instances of 2012 or 2014 and some on earlier versions the desire to have a consistent set of tools for performance analysis and monitoring means you probably won’t want to use Extended Events yet. Then there is the fact that in both SSAS 2012 and 2014 there is no user interface for working with Extended Events– instead, to create, start and stop a trace session you have to use XMLA commands. There are plenty of blog posts out there explaining how to do this but it’s still incredibly time-consuming and fiddly to do. Even in SSAS 2016, where there is a user interface for working with Extended Events and viewing their output, it’s pretty awful and nowhere near as good as Profiler (which is far from perfect itself, but at least useable). Perhaps at some point someone in the community will create a user-friendly tool for working with Extended Events, in the same way that the community created DAX Studio to make up for the shocking fact that even in SQL Server 2016 there is no proper support for running DAX queries in SQL Server Management Studio. I would prefer it if Microsoft did the job itself, though, and started taking tooling for BI seriously. Thirdly, if you want to do anything useful with the .xel files beyond open them up in SQL Server Management Studio, you’re going to need to use some TSQL and functions like sys.fn_xe_file_target_read_file. What happens if you don’t have an instance of the SQL Server relational engine handy though? Most SSAS shops use SQL Server as their data source, but not all – some use Oracle, or Teradata, or other relational databases, and for them installing an instance of SQL Server somewhere just to work with .xel files many not be an option. 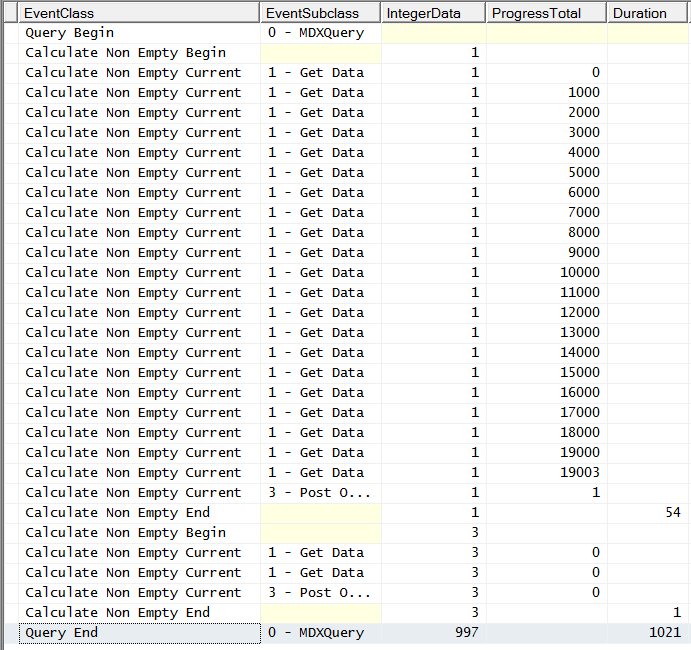 [Extended Events] won’t have the same impact on performance that a traditional Profiler Trace has. For example, it is reported that 20,000 events/sec on a 2ghz CPU with 1GB of RAM takes less than 2% of the CPU. If I was building a monitoring application (something like, say, SQL Sentry’s excellent Performance Advisor for Analysis Services) then this might be relevant. But 99% of the time I’m not running a Profiler trace on a Production server, I’m working on a dev or test server, and I always try to prevent other people doing stuff on a server while I’m doing tuning work too, so this is irrelevant. It’s a mistake to assume that Analysis Services users use Profiler for the same kinds of thing that SQL Server relational engine users do. For me, I use Profiler to get roughly the same kind of information that a SQL Server developer gets from a query plan: I use it to find out what’s going on in the engine when I run a single query, so the performance overhead is not something I care about. That said, it certainly seems to be the case that Extended Events will provide more information than I can get from a Profiler trace and allow me to do more things with that data than I can with Profiler. In SSAS 2016 there are several events that are only available via Extended Events and not via Profiler, although I have no idea what they do; I’m sure, with a bit of research, I can find out. Will any of them be useful? I have no idea yet but I suspect a few will be. Don’t get me wrong, I think Extended Events are a great technology and something all SSAS developers and administrators should learn. 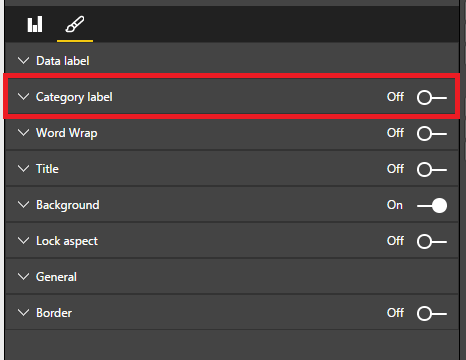 There’s still a lot of UI work to do by Microsoft before they are in a position to replace Profiler, but as I said earlier Microsoft hasn’t deprecated Profiler yet so it has given itself a lot of time to do this work. My only problem is with people like the aforementioned DBA who go around telling people they should be using Extended Events with SSAS right now because that’s what they’ve heard is the best practice and that’s what the recommendation is for the SQL Server relational engine. I’ll still need to use Profiler for a few more years yet. In Part 1 of this series I introduced the different types of non empty filtering that occur in Analysis Services Multidimensional and in Part 2 I showed how you can use monitor this activity using Profiler. In this, the final part of the series, I’m going to show some examples of how you can use this information while tuning MDX queries. There are two Non Empty operations here: the ProgressTotal column shows that first is the NON EMPTY statement on the rows axis; the second we can ignore because it’s the evaluation of the WHERE clause. 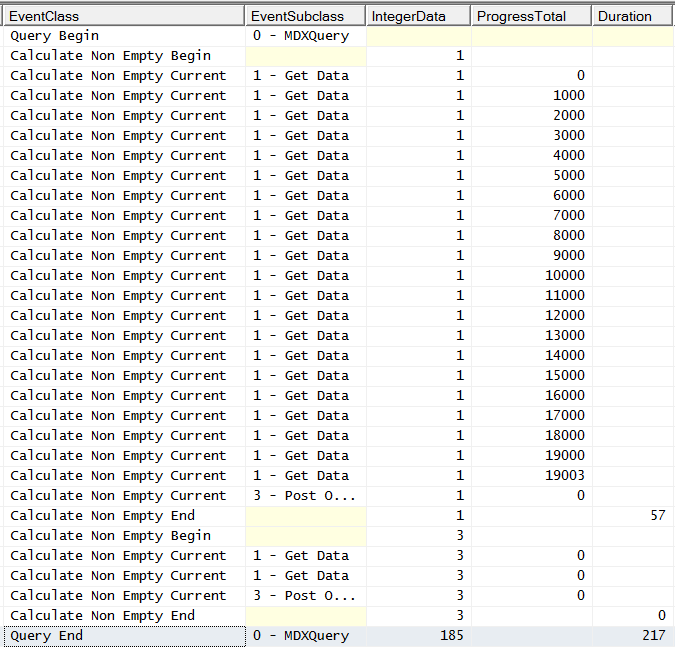 The Duration column shows that the first Non Empty operation takes just 54ms and the query as a whole takes 1021ms. 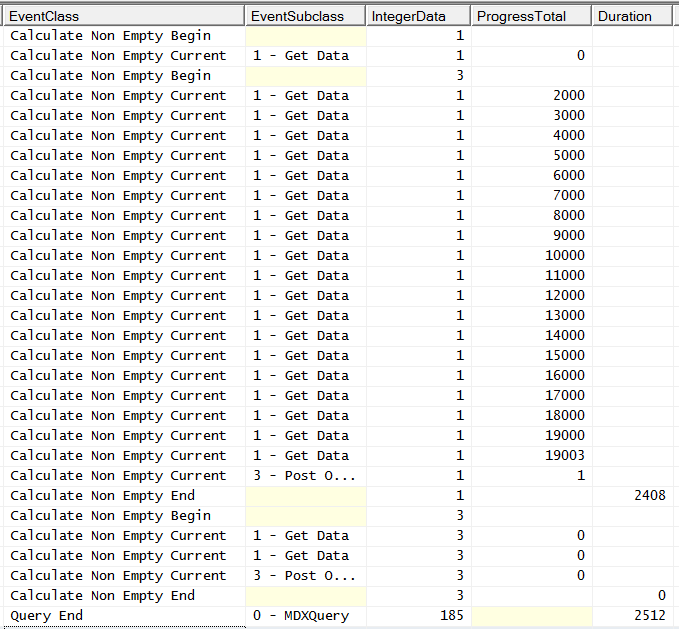 The query now takes 2512ms. But why is it slower? The obvious assumption to make is that it’s the Filter() that has slowed things down, but it looks like the Filter() and the NON EMPTY are now being evaluated as a single operation because the first Non Empty operation in the trace is now taking 2408ms – the majority of the query duration. …only makes things worse, increasing query duration to 4139ms. This confirms our suspicion that Filter() is the problem here and that NON EMPTY can remove the empty customers faster than Filter() can. The problem with the last query but one is that the NON EMPTY statement is being applied after the Filter(). 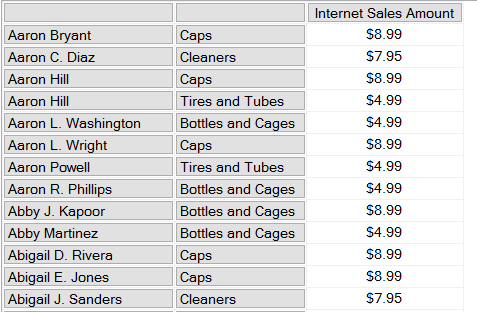 Wouldn’t it be faster to remove the empty customers first and then filter out the ones where Internet Sales Amount is less than $10, so the slower Filter() can be applied over a smaller set? Query duration is now down to 217ms and the first Non Empty operation is only 57ms. From what I can see, the HAVING clause performs a few milliseconds faster than the previous query – measurable but not something a user would notice. I also tested a variation on Mosha’s classic calculated measure approach for Count/Filter optimisation but that performed worse than the two previous queries.